“Prompted By Love” from Christian Faith Publishing author Mary Nettles is the story of Max Ellis and the love of his life, Jen. Max had planned to propose, but Jen’s revelations threaten everything. 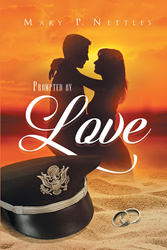 “Prompted By Love”: a love story thrown into doubt by untimely news. “Prompted By Love” is the creation of published author, Mary Nettles. Author Mary P. Nettles has devoted her life to ministry since the age of 12 when she first served as an assistant VBS teacher. Her lifelong desire to write was, however, not fulfilled until 2014 when "The Color of Roses" was published. After graduating from Moody Bible Institute in 1991, she worked in the pro-life ministry, which triggered a passion to show God's way of purity, until marriage, is best. Mary and her husband, Bob, have been married more than 50 years. They have moved more than 30 times between Germany and Hawaii. They now reside on a Christian boys' ranch where Mary writes and tutors. Bob works on the ranch with the help of their little dog, Sheila. The Nettles have two married sons, four grandchildren, including one married, and one great-grandson. Published by Christian Faith Publishing, Mary Nettles’ new book tells the story of Max Ellis and the love of his life. Air Force tanker pilot Max Ellis had many reasons for leaving Afghanistan, but the most important one was Jen. Jen was his best friend and the love of his life. He had intended to propose as soon as he made it home, but he suddenly learns Jen has some unsettling news that might change everything. View a synopsis of “Prompted By Love” on YouTube. Consumers can purchase “Prompted By Love” at traditional brick & mortar bookstores, or online at Amazon.com, Apple iTunes store, Kobo or Barnes and Noble. For additional information or inquiries about “Prompted By Love”, contact the Christian Faith Publishing media department at 866-554-0919.